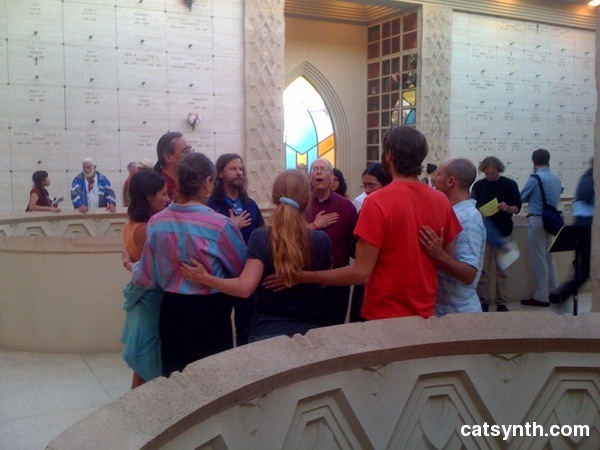 This past Monday on the Summer Solstice I once again attended the annual Garden of Memory at the Chapel of the Chimes in Oakland. This year, I was going not just as an audience member and reviewer, but also to participate with the Cornelius Cardew Choir, and also ended up playing in an impromptu electronic improvisation. Being practical, I first crossed the building to where the choir was located to check in and drop off a few things. 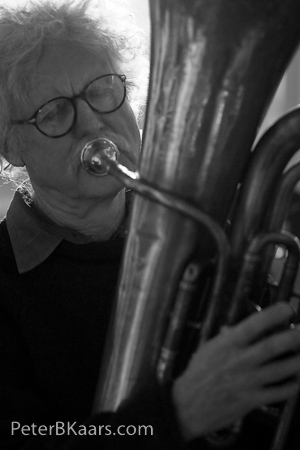 On the way I encountered Randy Porter’s “one man orchestra” featuring prepared guitar, brass instruments and tubing. This was a fun performance to watch, and it did not escape me that there were a lot of kids watching him, too. After dropping off my stuff, I wandered around the corner following some strong bass tones that echoed around the hallway. In one of the side chambers, Beth Custer was performing clarinet. 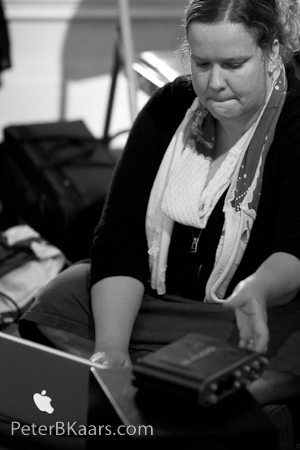 She produced a variety of standard and extended-technique tones. I was wondering if she also was going to perform using the array of other wind instruments behind her. 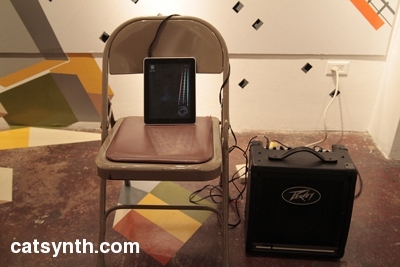 I continued to follow the resonant bass sounds and in a side room found Thomas Dimuzio performing dronelike sounds with guitar and effects. This section of his performance had long tones with heavy distortion and bass undertones that were the source of resonances in the main hallway. 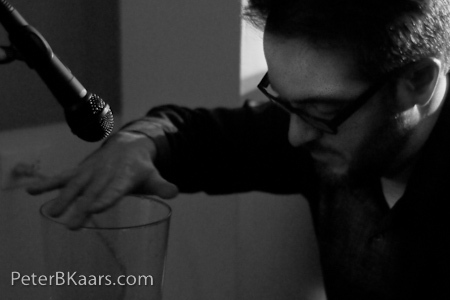 I sat to listen for a few minutes as his tone gradually moved away from distortion towards something more pure sounding. Nearby was an outdoor patio, where Orchestra Nostalgico was playing minor-key jazzy music that reminded me a bit of klezmer. One of my favorite new performances this year was the trio of Ken Ueno, Adam Fong and Edward Schocker. 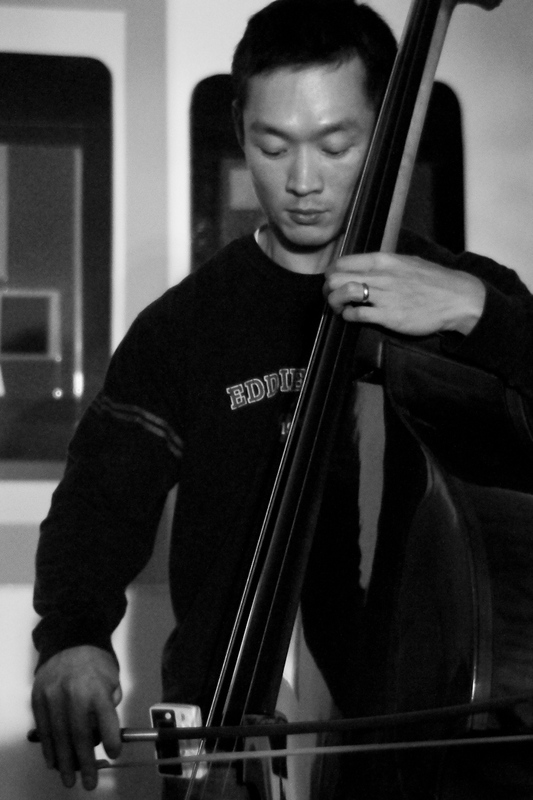 Ueno’s expressive and virtuosic vocals, which focus on a variety of extended techniques, blended well with Schocker’s performance on glasses and Fong’s bass. For example, Ueno’s vocals used techniques like throat singing with strong resonances, which complement harmonics on the bass. The sounds were more delicate at times, but the performance an aggressive, harder sound overall which I found welcome. It is interesting to note that they were situated in the Chapel of Tenderness. Maggie Payne had an installation in the same room as last year, once again making use of the fountain and other elements of the room. Next door was the Crank Ensemble, who were getting started with a new piece as I arrived. 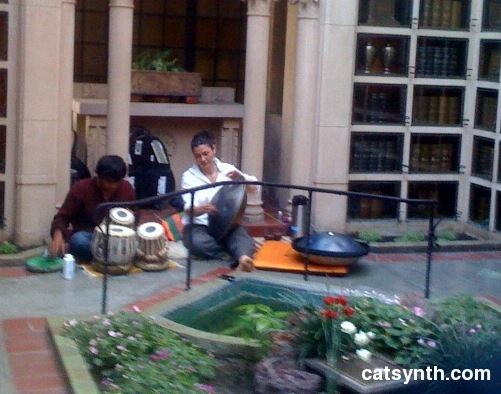 The instruments cover a wide range of sound-generation techniques and timbres, but they are all hand cranked. As such, they tend to produce regular rhythms of repeating notes and different rates. The piece began with some slow patterns of metallic and plucked sounds, but as more performers came in it got increasingly complex, with faster rhythms and more variety. One thing that is always readily apparent is how much physical effort it must take to operate some of those instruments, especially given the repetitive nature. An equally rhythmic but very different performance was unfolding in the Chapel of Eternal Wisdom. 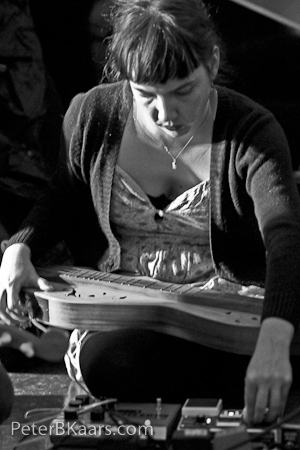 Laura Inserra performed on an instrument called a hang, a large tuned metal pod set against a percussionist with three tablas (as opposed to the standard two). 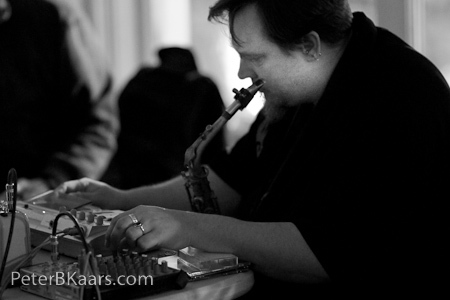 The duo quickly built up complex but meditative rhythms. Interestingly, there was another hang performance nearby (I am not sure which group this was, however). 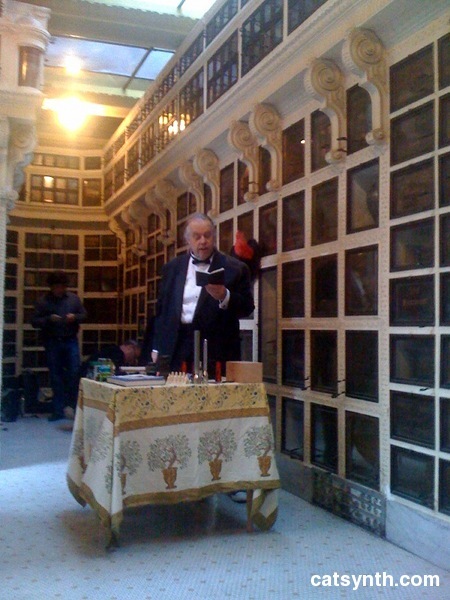 In the columbarium, a heard a performance of Gino Robair’s opera I Norton. I had seen a large production of the piece at least year’s San Francisco Electronic Music Festival. 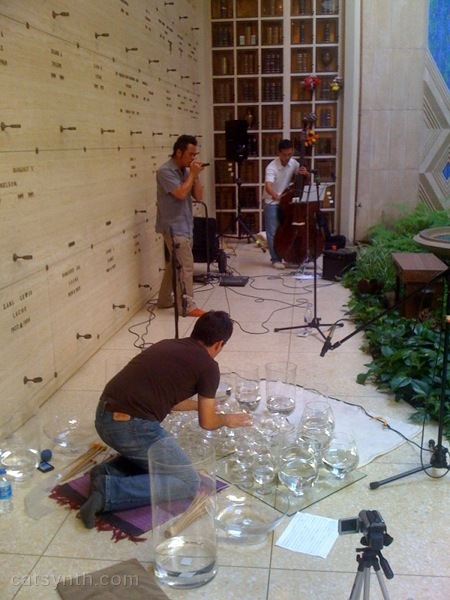 This performance once again featured Tom Duff in the role of Norton I, “Emperor of the United States and Protector of Mexico.” Robair performed with a small custom electronic instrument alongside a Bleep Labs Thingamagoop (I do want to get one of these at some point), with small portable speakers and taking advantage of the acoustics of the stone room. This performance also featured dance elements, and the two dancers also provided theatrical supporting vocals. Wandering back I heard Theresa Wong performing cello while singing a blues song. I have heard her perform cello both solo and in ensembles on many occasions, but had not heard her sing blues before. I then walked by another performance featuring cello. 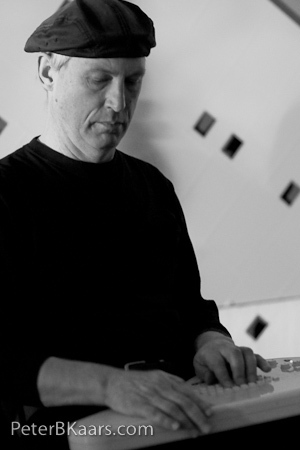 Albert Behar and the Movement combined cello with electronics to produce ambient music that sounded like a score for a film. I passed by a trio with our friends Tom Djll, Karen Stackpole and Ron Heglin. The combination of brass (Djll and Heglin) with Stackpole’s trademark gongs seemed like it would be quite a contrast, but at this particular moment, the short tones on the gongs and the bursts from the trumpet and trombone seemed to match in overall contour if not in timbre. It was then time for my first shift with the Cornelius Cardew Choir. We were performing a four-hour version of Pauline Oliveros’ The Heart Chant, in which performers enter and exit a circle, and while joined with others sing long tones on a steady pitch in between breaths. This turns out to require a lot of energy, singing a series of long tones for about ten minutes, especially for someone who does not do a lot of singing. I did my best, and also simultaneously listened to the sounds of the other voices and the overall harmonies. My favorite moment was when the harmony evolved organically into a steady perfect fifth. The overall quality, while very focused on the body and breadth, was meditative and calming. The piece is supposed to be one of healing, and I used the opportunity of this performance to send healing vibes to someone who needs them. At sundown, around 8:30PM, we led the annual ringing of bells, as part of Brenda Hutchinson’s Daily Bell project, which started in 2008 but continues every year. At 8:32PM bells started ringing throughout the main hall, gradually getting louder as more people joined in; and then a minute later, it came to an end. After sunset, I wandered down to the Sanctuary, a small dark room, where Sylvia Matheus and Thomas Miley were performing a large and richly textured electronic improvisation with a mixture of synthesized sounds and vocal samples. 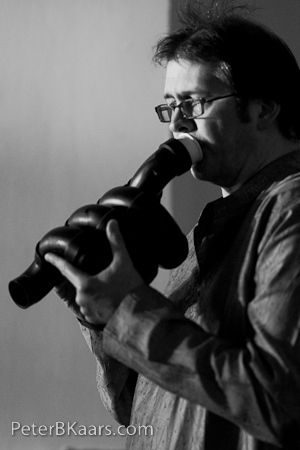 Gino Robair had joined in with the instrument he had used in I Norton, and at Matheus’ invitation I joined in as well, using several iPhone instruments such as the Bebot and Smule Ocarina. This spontaneous performance was a welcome coda to this long evening of music.